Among the Turkish condottieri who rose to high office in Northern Persia was one Alptagin, who, falling out with his Samanid lord, established himself with a couple of thousand followers in the fortress of Ghazni in the heart of the Afghan mountains (a. D. 962). Here, in a kind of no-man's-land, secure from interference, he made his little kingdom, and here after an interval his slave Sabuktagin reigned in his stead (976). The new ruler was not content with the original stronghold of his master. He gathered under his banner the neighbouring Afghan tribes, added whole provinces to his dominions-Laghman to the east in the Kabul valley and Sistan on the Persian side-and, when called to support the tottering Samanid prince of Bokhara against the encroaching Turks, he turned the occasion to his own advantage and placed his son Mahmud in command of the rich province of Khorasan. Sabuktagin was the first Moslem who attempted the invasion of India from the northwest. He went but a little way, it is true; his repeated defeat of Jaipal, the Brahman raja of the Panjab, in the Kabul valley, ended only in the temporary submission of the Indian king and the payment of tribute; but it pointed the way to Hindustan. Sabuktagin died in 997 before he could accomplish any larger scheme, but his son more than realized his most daring dreams. Mahmud had all his father's soldierly energy and spirit of command, joined to a restless activity, a devouring ambition, and the temper of a zealot. Zeal for Islam was the dominant note of the tenth-century Turks, as of most new converts. The great missionary creed of Mohammed, which to the Arabs and Persians had become a familiar matter of routine, was a source of fiery inspiration to the untutored men of the steppes. To spread the faith hy conquest doubled their natural zest for battle and endowed them with the devoted valour of martyrs. Mahmud was a staunch Moslem, and if his campaigns against the idolaters brought him rich store of treasure and captives, it was in his eyes no more than the fit reward of piety; and in the intervals between his forays into heathendom he would sit down and copy Korans for the welfare of his soul. The caliph of Baghdad, who had probably outgrown such illusions, was not the man to balk a willing sword. He sent Mahmud his pontifical sanction and the official diploma of investiture as rightful lord of Ghazni and Khorasan, and in the height of satisfaction Mahmud vowed that every year he would wage a Holy War against the infidels of Hindustan. If he did not keep the letter of his vow, he fell little short. Between the years 1000 and 1026 he made at least sixteen distinct campaigns in India, in which he ranged across the plains from the Indus to the Ganges. His first attack was, of course, upon the frontier towns of the Khaibar pass. His father's old enemy, Jaipal, endeavoured in vain to save Peshawar. Mahmud sent out 15,000 of his best horsemen and utterly routed him, despite his larger forces and his 300 elephants. Jaipal and fifteen of his kindred were brought captives before the conqueror. Their jewelled necklaces, worth, it is said, 180,000 dinars, or almost £90,000 apiece, were torn off, and half a million of slaves, and booty past all reckoning, according to the florid statements of the Oriental historians, fell into the hands of the Moslems. Mahmud was not cruel; he seldom indulged in wanton slaughter; and when a treaty of peace had been concluded, the raja and his friends were set free. Gibbon sums up the history of Asiatic dynasties as " one unceasing round of valour, greatness, discord, degeneracy, and decay." The kingdom Mahmud founded endured indeed for a century and a half after his death, but it diminished with every decade. It was not so much the result, however, of the discord and degeneracy of his successors, though discord began at once in the rivalry between his sons, and degeneracy was shown in the luxury of the court. 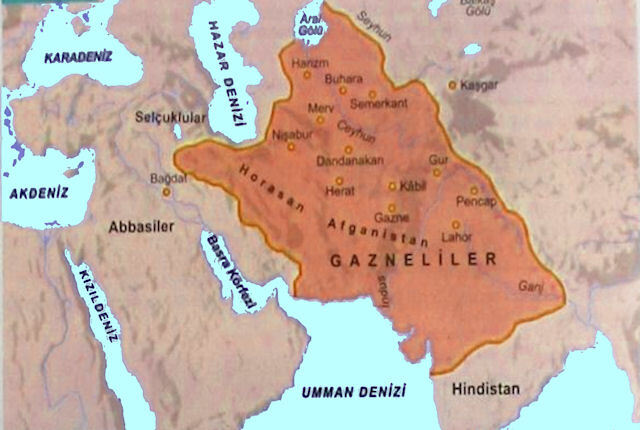 It was rather the inevitable consequence of the increasing pressure of the western Turks, the Ghuzz and other Turkman clans who were pouring into the pastures of Khorasan. What the adventurers of Ghazni had done, others of the same bold and capable race might also achieve, and the pastoral Seljuks, who now flocked from the Oxus lands southward into Persia, were led by chiefs who proved themselves Mahmud's equals in generalship and his superiors in power of organization. Their brilliant career of conquest cut off all Mahmud's Persian possessions in less than ten years after the Idol-breaker had passed away from the scene of his triumphs. 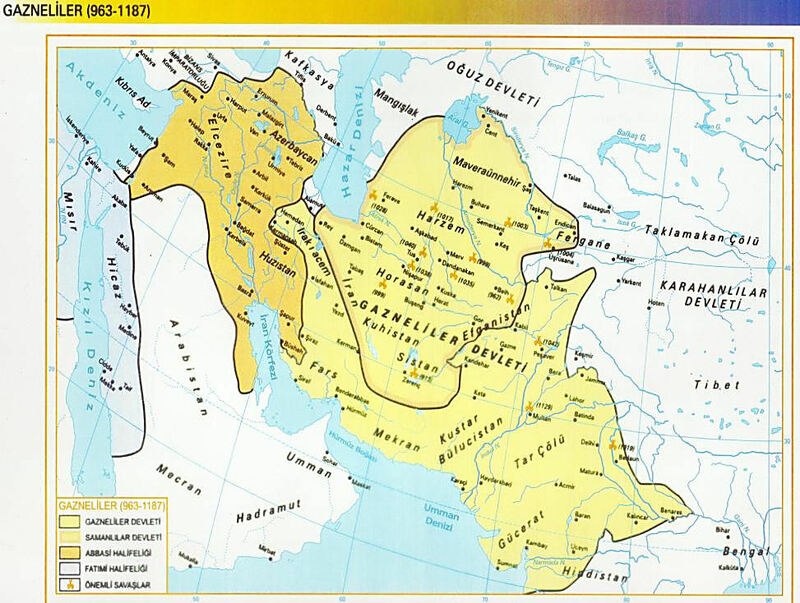 By 1038 Tughril Beg the Seljuk was proclaimed king of Khorasan, and when Mahmud's son, Mas'ud, at last awakened to the danger of the shepherd clans, whose presence he had tolerated within his borders, and marched in 1040 to subdue the rebels, he was utterly defeated at Dandanakan near Merv, and thenceforward Persia was lost to the house of Ghazni. The names of the many luminaries who shone at the court of Ghazni may not convey very definite ideas to Western readers, but they are among the leaders of Eastern literature and science, and some have a reputation outside the circle of Orientalists. Al-Biruni, the astronomer, chronologist, and even student of Sanskrit; Al-Farabi, the philosopher, whom Mahmud prized the more since Avicenna himself refused to be lured to Ghazni; Al-Utbi, the historian and secretary to the Sultan; Al-Baihaki, whose gossiping memoirs have earned him the title of " the Oriental Mr. Pepys; " Unsuri and Farrukhi and Asjudi, among the earliest poets of the Persian revival, and above all Firdausi, the Persian Homer, in whose " Shah Namah " the legendary heroes of ancient Iran live for ever-these were among the men to whom Mahmud was gracious, and who in return made Ghazni and its master renowned beyond the fame of glorious war. The man who could so create and develop a centre of civilization was no barbarian. Like many another, Mahmud is said to have devoted himself to the cultivation of his mind in order to efface the impression of his physical defects; but it was no ordinary mind that he had to work upon, and no mean genius that could expand a little mountain principality into an empire that stretched to the Caspian and Aral Seas and almost to the Tigris, and that covered, at least for the time, half the vast plains and teeming population of Hindustan. Brief as was the occupation of most of this immense territory, it was a stupendous feat of acquisition. He was aided, no doubt, by the dissensions of his neighbours; the break-up of the Samanid kingdom and the divisions of the Buwaihid princes in Persia opened the road to annexation in the west, just as the jealousies of the Indian rajas favoured aggression in the east. The barrier set on the west, while it bounded the ambitions of Mahmud's successors, did not immediately throw them into the far more valuable provinces of India. They continued to hold the Panjab, the only part of his Indian conquests that was permanently annexed, but even there their authority was uncertain, and when it was strongest under a firm governor there was most risk of separation. A capable Turkish amir who had witnessed the successful rise of other Turks in Asia was likely to be tempted to convert his distant Indian province into a kingdom. Troubles of this kind began very soon. Mahmud had left Ali Ariyaruk as governor and commander-in-chief in India. Under Mas'ud, this viceroy's power became dangerous, and he was allured to Ghazni, where his numerous following of truculent retainers confirmed the fears of the court. Like many Turks, Ariyaruk had a weakness for drink, which proved his undoing. The wise vizir, Khwaja Ahmad Hasan Maimandi, who was in Oriental phrase " a great cucumber," or man of guile, led the unlucky general on; the king sent him fifty flagons of wine when he was already excited; the poor wretch staggered into the court, lured on by the conspirators, and there was an end of him. Such scenes were not uncommon at Ghazni, where zeal for the faith was often combined with a reckless disregard of the law of Islam, which forbids the use of fermented liquor. It was not merely that the soldiery and their officers indulged in drunken brawls; the Sultan Mas'ud himself used to enjoy regular bouts in which he triumphantly saw all his fellow topers "under the table." Such orgies were characteristic of the Turkish rulers of Ghazni. Even the great Mahniud had his drinking fits, which he excused on the ground that they afforded a rest to his people; but his son Mas'ud carried them to far greater excess. The Seljuks were busy in subduing Persia, and left Ghazni undisturbed; thither, and for more than a century the Ghaznavids, as his descendants are called, dwelt in their mountain city with gradually decaying power. Their individual reigns are of little importance. They are described as men of benevolent character and signal piety; and some of them, such as Ibrahim, devoted themselves to the improvement and good government of their subjects. The fact that Ibrahim and Bahram sat on the throne, the one for over forty, the other for thirty-five years, shows that there was peace and stability, at least in the central government. But peace was purchased at the cost of power. The later kings of Ghazni, learning by a series of defeats that their western neighbours were not to be trifled with, made terms with the Seljuks and allied the two dynasties by politic marriages, thus reducing Ghazni from the proud position of the capital of a kingdom to little more than a dependency of the empire of Malik Shah. The fratricidal' struggles, which were a common feature of Ghaznavid successions, even brought these dangerous Turkish neighbours into the mountains, and in 1116 the Seljuk Sanjar was in temporary possession of Ghazni as the protector of Bahram against his brother Arslan Shah. There was little danger, however, of the enemy settling permanently in the Afghan country. There was more attractive land to the west, and a dynasty that had spread its dividing branches to the Mediterranean and Damascus was not likely to be enamoured of the crags and glades beneath the Hindu Kush. So long as the kings of Ghazni preserved an attitude of decorous deference, there was little fear of Seljuk aggression. Nor was there much danger of reprisals from the side of India. An army of eighty thousand Hindus did indeed seize Lahore in 1043; but the enemy hastily withdrew on the approach of the forces of Ghazni. The terror of Mahmud's campaigns had left too crushing an impression to permit the Indians to dream of serious retaliation. The Panjab remained a Moslem province, and a century later became the last refuge of Mahmud's descendants. The force that uprooted the Ghaznavids came neither from the east nor from the west. It grew up in their midst. In the rugged hills of Ghor, between Ghazni and Herat, stood the castle of Firoz-kuh, the "Hill of Victory," where a bold race of Afghan highlanders followed the banner of the chief of Sur. The castle had submitted to Mahmud in 1010, but the conqueror left the native chief in tributary possession, and the Suri horsemen eagerly took the Sultan's pay and fought in his campaigns against the infidels. These fiery hillmen respected the great soldier, but for his weak successors they cared little, and feared them less. A conflict was brought about by the death of one of the Suri chiefs at the hands of Bahram Shah. The highlanders of Ghor marched to avenge his murder, and their rude vigour so overmastered the troops of Ghazni, enfeebled by a century of inglorious ease, that Bahram and his army were driven pell-mell into India (1148). Two brothers of the princely race of Sur had now successively been slain by the King of Ghazni: a third brother avenged them. In 1155 Ala-ad-din Husain, reprobated for all time by the title of " World-burner " (Jahan-soz), burst into Ghazni on an errand of slaughter and destruction, slew the men without mercy, enslaved the women and children, and carried fire and sword throughout the land. Of all the noble buildings with which the kings had enriched their stately capital hardly a stone was left to tell of its grandeur. The very graves of the hated dynasty were dug up and the royal bones scattered to the dogs, yet even Afghan vengeance spared the tomb of Mahmud, the idol of Moslem soldiers. That tomb and two lofty minarets, at a little distance from the modern town, alone stand to show that Ghazni was. The attempt of Bahram's son, Khusru Shah [r. 1152-1160 ], to recover the command in Afghanistan failed utterly; he found Ghazni and the other towns in ruins, the tribes disloyal, and the Ghuzz Turkmans overrunning the land. The comparatively orderly rule of the kings of Ghazni had given place to anarchy, and so it remained for many years. 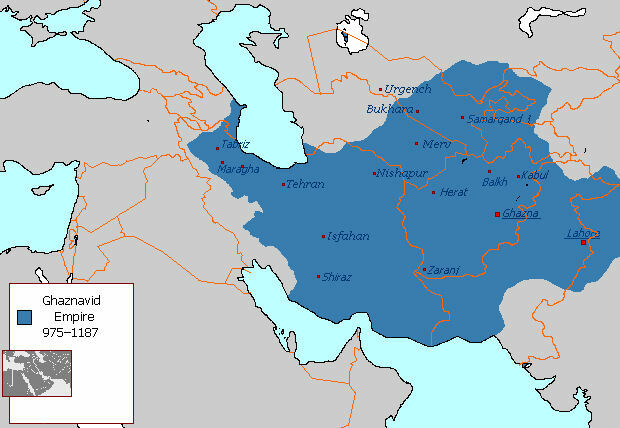 Ala-ad-din, the " Worldburner," was content to rule his clan at Firoz-kuh; but after his death in 1161, and that of his son two years later, his nephew Ghiyas-ad-din ibn Sam became chief of Ghor, and with his accession the Afghan highlanders entered upon a new phase of activity. Ghiyas-ad-din recovered Ghazni from the mob of Ghuzz in 1173-4, and established his brother Mu'izz-ad-din on the ruined throne of Mahmud. In 1184 Mohammad Ghori ravaged the territory of Lahore and fortified Sialkot. This was coming to close quarters, and the king in desperation called in the help of the Gakkars and laid siege to the fortress. The Ghorian outmanoeuvred him by a trick, and getting between Khusru and his capital, compelled him to surrender (1185 or 1186). The prisoner and his son were taken to Firoz-kuh and confined in a fort, where after five years the last of the Ghaznavids were put to death.